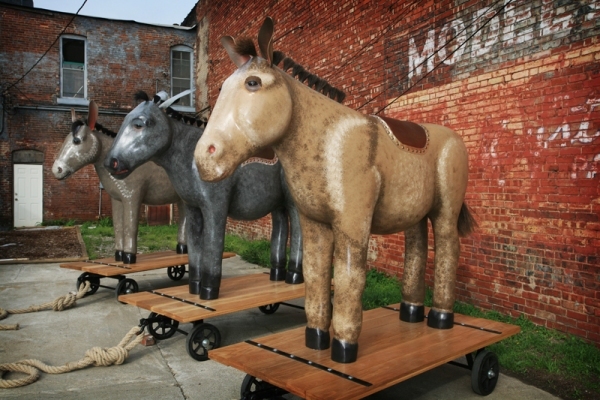 The Donkey, The Jackass, and The Mule was a parade project in which I made three large-scale wooden pull-toys and performed them with Freetown Village Living History Museum in a city-wide art parade organized by the Indianapolis Museum of Art. Reenactors at Freetown Village depict a symbolic community of composite characters representing African Americans living in Indianapolis in 1870—five years after the American Civil War ended. For the parade, we performed a protest against the exclusion of women from the Fifteenth Amendment, which gave free black men the right to vote but excluded all women. Participants rallied at Fountain Square, then took to the streets, chanting and carrying placards with slogans such as "Sojourner Truth for President", "Amend the 15th", and "Marching on to Victory". This was a reenactment of a reenactment performed by Freetown Village during Jesse Jackson’s presidential election campaign in the 1980s. Conceived as fiction-based-on-fact, this project was meant to provide a pocket of history within the parade, with signage connecting the past to the present through references to the Civil War, the Civil Rights movement, and the current presidential primaries. As it turned out, both Hillary Clinton and Barack Obama were campaigning in Indiana on the day of the parade. Three performative sculptures commissioned by the Indianapolis Museum of Art for the exhibition "On Procession," curated by Rebecca Uchill. Made in the context of an artist residency at the Herron School of Art and Design Sculpture Department. Performed in the museum's "On Procession" parade (April 26th, 2008) by Freetown Village Living History Museum. Photo credit Lisi Raskin. Photo by Allison Smith and Michelle Pemberton. Commissioned by the Indianapolis Museum of Art for the exhibition "On Procession," curated by Rebecca Uchill. Portrait of reenactors who performed in the museum's "On Procession" parade (April 26th, 2008) with Freetown Village Living History Museum. Photo exhibited in the IMA's "On Procession" exhibition. Photo by Allison Smith and Michelle Pemberton. Commissioned by the Indianapolis Museum of Art for the exhibition "On Procession," curated by Rebecca Uchill. Portrait of Sarah Elizabeth Cuffee, seamstress, played by April Lynem, who performed in the museum's "On Procession" parade (April 26th, 2008) with Freetown Village Living History Museum. Photo exhibited in the IMA's "On Procession" exhibition. Commissioned by the Indianapolis Museum of Art for the exhibition "On Procession," curated by Rebecca Uchill. Distributed throughout Indianapolis, Indiana in early 2008. Drawing by Allison Smith; designed by Arjen Noordeman; published by the Indianapolis Museum of Art. Three Performative sculptures, twenty wooden placards, and a series of photographs commissioned by the Indianapolis Museum of Art for the exhibition "On Procession," curated by Rebecca Uchill. Made in the context of an artist residency at the Herron School of Art and Design Sculpture Department. Performed in the museum's "On Procession" parade (April 26th, 2008) by Freetown Village Living History Museum. Photo courtesy of the Indianapolis Museum of Art. approx. 102" h x 96" l x 41" w Please click on image again for more detail. One of three performative sculptures commissioned by the Indianapolis Museum of Art for the exhibition "On Procession," curated by Rebecca Uchill. Made in the context of an artist residency at the Herron School of Art and Design Sculpture Department. Performed in the museum's "On Procession" parade (April 26, 2008) by living history organization Freetown Village (www.freetown.org). Photo credit Allison Smith.